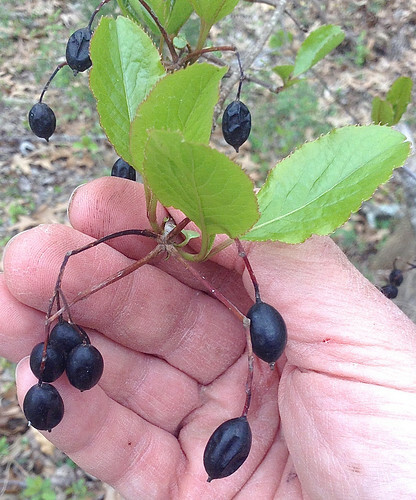 Ripe fruit of Rusty Blackhaw. 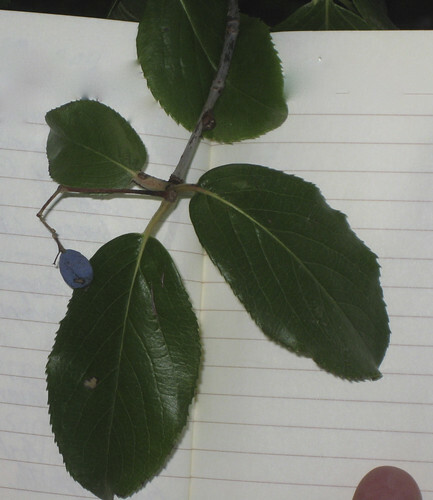 Close-up of Rusty Blackhaw fruit. 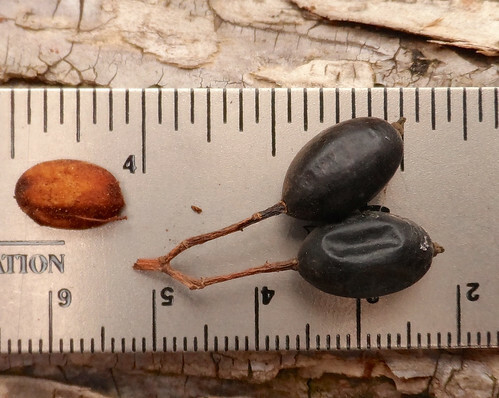 Note the single large, flat seed. 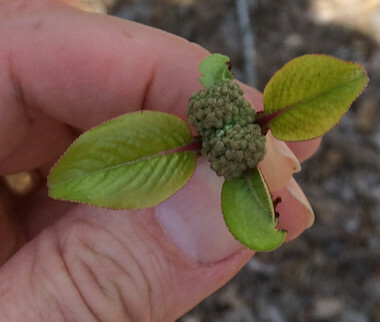 Rusty blackhaw flower buds appear in late winter/early spring before a majority of its leaves do. 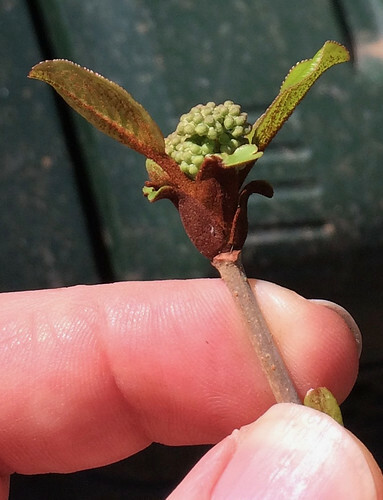 The flowers look like little heads of broccoli before blooming. 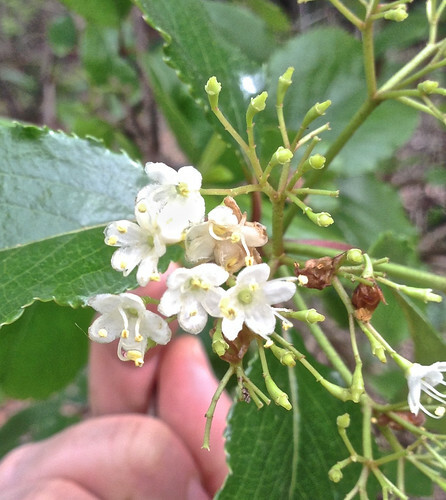 Note the rusty color of the parts of rusty blackhaw wrapping up the flower buds. 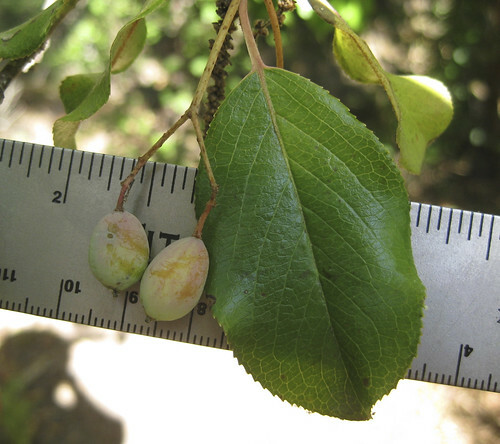 Unripe Rusty Blackhaw fruit (picture taken in September in Houston). Leave are arranged oppositely, have finely-toothed edges, and an oval shape. 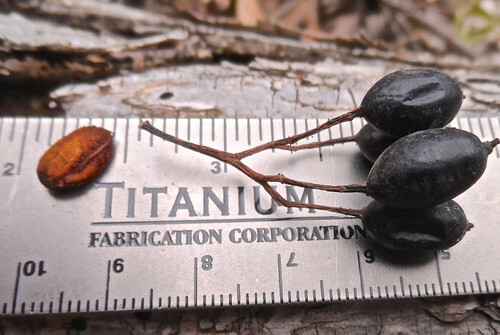 Bark of rusty blackhaw is rugged, and often described as alligator-like. When scraped it exposes it's rusty, red-brown color of its name. 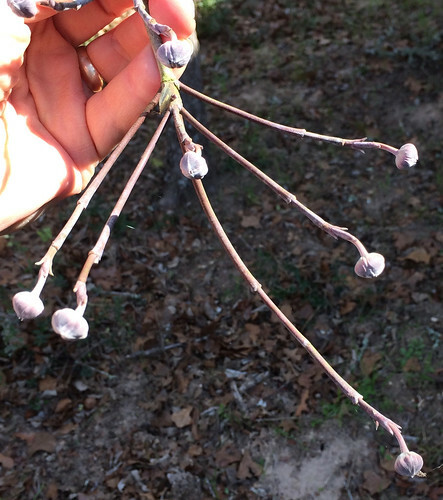 Hidden among the woods of east Texas one will find a true treasure, the Rusty Blackhaw. This small tree lives its life in the shade of much larger majestic oaks, sweetgums, hickories, and hackberries. In the spring Rusty Blackhaws announce their presence with large clusters of small, white flowers similar to Elder. After these flowers do their job and drop away odd, football-shade drupes (fruit) appear. These fruit start out green but shift through shades of blue, red, purple through the summer until by late fall they are black and ready to eat. In the fall the leaves turn deep red and begin to drop off but many leaves remain even as new ones begin appearing. 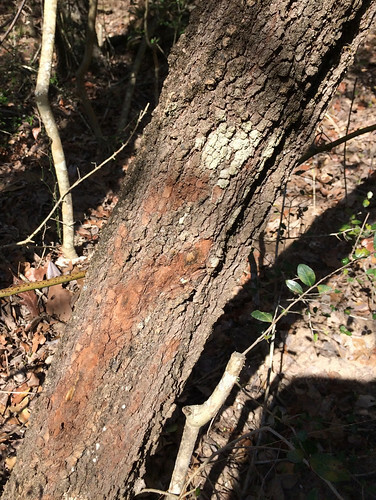 The bark of the trunk and branches of this tree have the same brick-like pattern and reddish-tan color of its close relative, the Farkleberry. The mature fruit of Rusty Blackhaws is sweet and delicious. Even in late winter when they've dried into wrinkled raisin-like fruit they are often still quite edible. 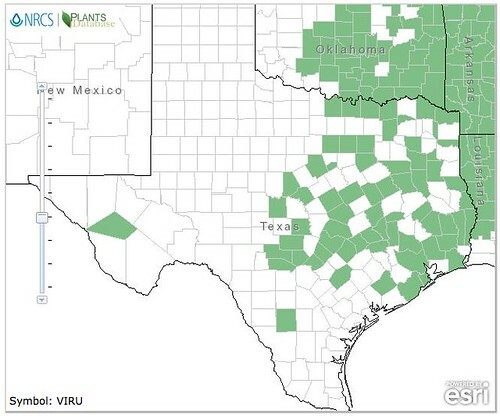 The large single seed isn't edible but as you eat the fruit save the seeds to plant in other likely spots. This wonderful tree is a native and needs to be spread. When making jelly, these fruit usually have a large amount of natural pectin but the amount can vary quite a bit from tree to tree. It's good to have a bit of extra pectin on hand in case you fruit is low.